^ a b c d Daley, Allison; Antcliffe, Jonathan; Drage, Harriet; Pates, Stephen (2018-05-21). “Early fossil record of Euarthropoda and the Cambrian Explosion”. Proceedings of the National Academy of Sciences 115: 201719962. doi:10.1073/pnas.1719962115. https://www.researchgate.net/publication/325275404_Early_fossil_record_of_Euarthropoda_and_the_Cambrian_Explosion?ev=publicSearchHeader&_sg=w2vqyEGTVn0XGu-foabSSqxq-ic8EqYvx-1JQtfkTbNjup2t2X7h5LVXhaRoRN1dHbsiov_gjm2WrY8. ^ Lamsdell, James C.; Dunlop, Jason A.. “Segmentation and tagmosis in Chelicerata” (英語). Arthropod Structure & Development 46 (3): 395–418. ISSN 1467-8039. https://www.academia.edu/28212892/Segmentation_and_tagmosis_in_Chelicerata. ^ “The tettigoniid (Orthoptera : Tettigoniidae) ear: Multiple functions and structural diversity” (英語). International Journal of Insect Morphology and Embryology 22 (2-4): 185–205. (1993-04-01). doi:10.1016/0020-7322(93)90009-P. ISSN 0020-7322. https://www.sciencedirect.com/science/article/pii/002073229390009P. ^ Yager, David; Hoy, Ron (1988-01-01). “The midline metathoracic ear of the praying mantis, Mantis religiosa”. Cell and tissue research 250: 531–41. doi:10.1007/BF00218944. https://www.researchgate.net/publication/19470569_The_midline_metathoracic_ear_of_the_praying_mantis_Mantis_religiosa. ^ Kühl, Gabriele; Briggs, Derek E. G.; Rust, Jes (2009-02-06). “A Great-Appendage Arthropod with a Radial Mouth from the Lower Devonian Hunsrück Slate, Germany” (英語). Science 323 (5915): 771–773. doi:10.1126/science.1166586. ISSN 0036-8075. PMID 19197061. http://science.sciencemag.org/content/323/5915/771. ^ Paterson, John R.; García-Bellido, Diego C.; Lee, Michael S. Y.; Brock, Glenn A.; Jago, James B.; Edgecombe, Gregory D. (2011-12). “Acute vision in the giant Cambrian predator Anomalocaris and the origin of compound eyes” (英語). Nature 480 (7376): 237–240. doi:10.1038/nature10689. ISSN 0028-0836. https://www.nature.com/articles/nature10689. ^ Cong, Peiyun; Ma, Xiaoya; Hou, Xianguang; Edgecombe, Gregory D.; Strausfeld, Nicholas J. (2014-07-16). “Brain structure resolves the segmental affinity of anomalocaridid appendages” (英語). Nature 513 (7519): 538–542. doi:10.1038/nature13486. ISSN 0028-0836. https://doi.org/10.1038/nature13486. ^ a b c d e Javier, Ortega-Hernández,. “Making sense of ‘lower’ and ‘upper’ stem-group Euarthropoda, with comments on the strict use of the name Arthropoda von Siebold, 1848” (英語). Biological Reviews 91 (1). ISSN 1464-7931. https://www.academia.edu/9363838/Making_sense_of_lower_and_upper_stem-group_Euarthropoda_with_comments_on_the_strict_use_of_the_name_Arthropoda_von_Siebold_1848. ^ Aguinaldo, Anna Marie A.; Turbeville, James M.; Linford, Lawrence S.; Rivera, Maria C.; Garey, James R.; Raff, Rudolf A.; Lake, James A. (1997-05). “Evidence for a clade of nematodes, arthropods and other moulting animals” (英語). Nature 387 (6632): 489–493. doi:10.1038/387489a0. ISSN 0028-0836. https://doi.org/10.1038/387489a0. ^ Adoutte, A; Balavoine, Guillaume; Lartillot, N; Lespinet, O; Prud'homme, B; de Rosa, R (2000-05-01). The new animal phylogeny: Reliability and implications. 97. https://www.researchgate.net/publication/12535812_The_new_animal_phylogeny_Reliability_and_implications. ^ Persson, Dennis K.; Halberg, Kenneth A.; Jørgensen, Aslak; Møbjerg, Nadja; Kristensen, Reinhardt M. (2012-11-01). “Neuroanatomy of Halobiotus crispae (Eutardigrada: Hypsibiidae): Tardigrade brain structure supports the clade panarthropoda” (英語). Journal of Morphology 273 (11). doi:10.1002/jmor.20054/abstract. ISSN 1097-4687. http://onlinelibrary.wiley.com/doi/10.1002/jmor.20054/abstract. ^ Omar Rota-Stabelli, Ehsan Kayal, Dianne Gleeson, Jennifer Daub, Jeffrey L. Boore, Maximilian J. Telford, Davide Pisani, Mark Blaxter & Dennis V. Lavrov (2010). “Ecdysozoan mitogenomics: evidence for a common origin of the legged invertebrates, the Panarthropoda”. Genome Biology and Evolution 2: 425–440. doi:10.1093/gbe/evq030. PMID 20624745. http://gbe.oxfordjournals.org/content/2/425. ^ Hyun Ryu, Shi; Lee, Jimin; Jang, Kuem-Hee; Hwa Choi, Eun; Ju Park, Shin; Chang, Cheon; Kim, Won; Hwang, Ui Wook (2008-01-01). “Partial mitochondrial gene arrangements support a close relationship between Tardigrada and Arthropoda”. Molecules and cells 24: 351–7. https://www.researchgate.net/publication/5667274_Partial_mitochondrial_gene_arrangements_support_a_close_relationship_between_Tardigrada_and_Arthropoda. ^ Aguinaldo, A. M. A.; J. M. Turbeville, L. S. Linford, M. C. Rivera, J. R. Garey, R. A. Raff, & J. A. Lake (1997). “Evidence for a clade of nematodes, arthropods and other moulting animals”. Nature 387: 489–493. doi:10.1038/387489a0. ^ a b c Yang, Jie; Ortega-Hernández, Javier; Legg, David A.; Lan, Tian; Hou, Jin-bo; Zhang, Xi-guang (2018-02-01). “Early Cambrian fuxianhuiids from China reveal origin of the gnathobasic protopodite in euarthropods” (英語). Nature Communications 9 (1). doi:10.1038/s41467-017-02754-z. ISSN 2041-1723. https://www.nature.com/articles/s41467-017-02754-z. 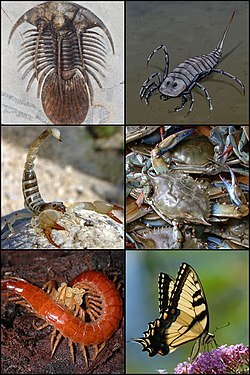 ^ a b c d e f g “Origin and evolution of the panarthropod head – A palaeobiological and developmental perspective” (英語). Arthropod Structure & Development 46 (3): 354–379. (2017-05-01). doi:10.1016/j.asd.2016.10.011. ISSN 1467-8039. https://www.sciencedirect.com/science/article/pii/S1467803916301669. ^ Budd, Graham (1993-08). “A Cambrian gilled lobopod from Greenland” (英語). Nature 364 (6439): 709–711. doi:10.1038/364709a0. ISSN 0028-0836. https://doi.org/10.1038/364709a0. ^ BUDD, GRAHAM E. (1996-03). “The morphology of Opabinia regalis and the reconstruction of the arthropod stem-group” (英語). Lethaia 29 (1): 1–14. doi:10.1111/j.1502-3931.1996.tb01831.x. ISSN 0024-1164. https://onlinelibrary.wiley.com/doi/abs/10.1111/j.1502-3931.1996.tb01831.x. ^ a b Peiyun Cong; Xiaoya Ma; Xianguang Hou; Gregory D. Edgecombe; Nicholas J. Strausfeld (2014). “Brain structure resolves the segmental affinity of anomalocaridid appendages”. Nature 513 (7519): 538–42. doi:10.1038/nature13486. PMID 25043032. ^ Van Roy, Peter; Daley, Allison C.; Briggs, Derek E. G. (2015-03-11). “Anomalocaridid trunk limb homology revealed by a giant filter-feeder with paired flaps” (英語). Nature 522 (7554): 77–80. doi:10.1038/nature14256. ISSN 0028-0836. https://www.nature.com/articles/nature14256. ^ a b c Regier, Jerome C.; Shultz, Jeffrey W.; Zwick, Andreas; Hussey, April; Ball, Bernard; Wetzer, Regina; Martin, Joel W.; Cunningham, Clifford W. (2010-02). “Arthropod relationships revealed by phylogenomic analysis of nuclear protein-coding sequences” (英語). Nature 463 (7284): 1079–1083. doi:10.1038/nature08742. ISSN 0028-0836. https://doi.org/10.1038/nature08742. ^ a b Oakley, Todd H.; Wolfe, Joanna M.; Lindgren, Annie R.; Zaharoff, Alexander K. (2012-09-12). “Phylotranscriptomics to Bring the Understudied into the Fold: Monophyletic Ostracoda, Fossil Placement, and Pancrustacean Phylogeny” (英語). Molecular Biology and Evolution 30 (1): 215–233. doi:10.1093/molbev/mss216. ISSN 1537-1719. https://doi.org/10.1093/molbev/mss216. ^ Telford, Maximilian J.; Thomas, Richard H. (1998-09-01). “Expression of homeobox genes shows chelicerate arthropods retain their deutocerebral segment” (英語). Proceedings of the National Academy of Sciences 95 (18): 10671–10675. ISSN 0027-8424. PMID 9724762. http://www.pnas.org/content/95/18/10671. ^ Giribet, Gonzalo; Ribera, Carles (2000-06). “A Review of Arthropod Phylogeny: New Data Based on Ribosomal DNA Sequences and Direct Character Optimization” (英語). Cladistics 16 (2): 204–231. doi:10.1111/j.1096-0031.2000.tb00353.x. ISSN 0748-3007. https://doi.org/10.1111/j.1096-0031.2000.tb00353.x. ^ Nardi, Francesco; Spinsanti, Giacomo; Boore, Jeffrey L.; Carapelli, Antonio; Dallai, Romano; Frati, Francesco (2003-03-21). “Hexapod Origins: Monophyletic or Paraphyletic?” (英語). Science 299 (5614): 1887–1889. doi:10.1126/science.1078607. ISSN 0036-8075. PMID 12649480. http://science.sciencemag.org/content/299/5614/1887. ^ Dunlop, J. A.; Arango, C. P. (2005). “Pycnogonid affinities: A review”. Journal of Zoological Systematics and Evolutionary Research 43: 8–21. doi:10.1111/j.1439-0469.2004.00284.x. ^ Haas, M. Susan; Brown, Susan J.; Beeman, Richard W. (2001-03-08). “Homeotic evidence for the appendicular origin of the labrum in Tribolium castaneum” (英語). Development Genes and Evolution 211 (2): 96–102. doi:10.1007/s004270000129. ISSN 0949-944X. https://doi.org/10.1007/s004270000129. ^ Du, Xiaoliang; Yue, Chao; Hua, Baozhen (2009-08). “Embryonic development of the scorpionflyPanorpa emarginataCheng with special reference to external morphology (Mecoptera: Panorpidae)” (英語). Journal of Morphology 270 (8): 984–995. doi:10.1002/jmor.10736. ISSN 0362-2525. https://onlinelibrary.wiley.com/doi/abs/10.1002/jmor.10736. ^ “Origin and evolution of the panarthropod head – A palaeobiological and developmental perspective” (英語). Arthropod Structure & Development 46 (3): 354–379. (2017-05-01). doi:10.1016/j.asd.2016.10.011. ISSN 1467-8039. https://www.sciencedirect.com/science/article/pii/S1467803916301669. ^ Lamsdell, James (2013-01-01). “Revised systematics of Palaeozoic ‘horseshoe crabs’ and the myth of monophyletic Xiphosura”. Zoological Journal of the Linnean Society 167: 1–27. doi:10.1111/j.1096-3642.2012.00874.x. https://www.researchgate.net/publication/259572939_Revised_systematics_of_Palaeozoic_'horseshoe_crabs'_and_the_myth_of_monophyletic_Xiphosura. ^ Tanaka, Gengo; Hou, Xianguang; Ma, Xiaoya; Edgecombe, Gregory D.; Strausfeld, Nicholas J. (2013-10). “Chelicerate neural ground pattern in a Cambrian great appendage arthropod” (英語). Nature 502 (7471): 364–367. doi:10.1038/nature12520. ISSN 0028-0836. https://www.nature.com/articles/nature12520. ^ Basset, Yves; Cizek, Lukas; Cuenoud, Philippe; Didham, Raphael; Guilhaumon, Francois; Missa, Olivier; Novotny, Vojtech; Ødegaard, Frode et al. (2012-12-14). “Arthropod Diversity in a Tropical Forest”. Science 338: 1481–1484. doi:10.1126/science.1226727. https://www.researchgate.net/publication/233904266_Arthropod_Diversity_in_a_Tropical_Forest. ^ Ortega-Hernández, Javier; Azizi, Abdelfattah; Hearing, Thomas W.; Harvey, Thomas H. P.; Edgecombe, Gregory D.; Hafid, Ahmid; El Hariri, Khadija (2017-02-17). “A xandarellid artiopodan from Morocco – a middle Cambrian link between soft-bodied euarthropod communities in North Africa and South China” (英語). Scientific Reports 7 (1). doi:10.1038/srep42616. ISSN 2045-2322. https://www.nature.com/articles/srep42616#f1%7CA.